It is not a big step from leafminers to gall makers; Cystiphora-‘mines’ for instance are a typical border case. Moreover, when searching for leafmines one often encounters galls. Therefore some space is made available in this site for galls and gall makers. Mainly for microphotos, because normal pictures are widely available on the internet and in the book of e.g. Coulianos & Holmåsen (1991a). For identification keys one is referred to Buhr (1964b, 1965a), Docters van Leeuwen (1982a), Dauphin & Aniotsbehere (1997a) and Redfern & Shirley (2002a, 2011a). An extensive discussion about plant galls is available in the book by Margaret Redfern (2011a). Hering (1951a) defines a gall as follows: “The concept of a gall envisages a quite definite reaction by the plant to the presence of the intruder, who in turn is specifically dependant on the tissue of the plant, which has been produced as this reaction.” A galling insect therefore not only lives inside, but also from, the gall. A leafminer lives inside and from a plant, but does not feed on the tissues that are produced as a reaction to its presence (callus). The mines of Cystiphora-species are small, mostly intensely coloured warts that enclose a cavity with one are a few larvae. The larvae live on the plant sap that leaks into the cavity; perhaps they stimulate the leaking a bit by puncturing the cells lining the cavity. It is not well possible to decide whether these larvae live on a tissue made by the plant in reaction to their presence (as gall makers) or that they feed on “normal” plant tissue (as miners). 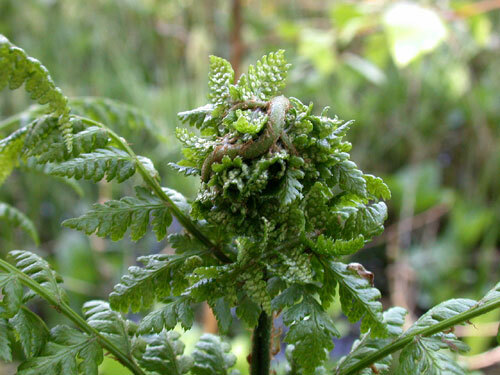 The larva of Chirosia betuleti feeds on the tissue of the midrib of a fern; in reaction the midrib intensively curls and encloses the larva. Undeniably, the larva partly lives on tissue that has been produced in reaction to its presence: gall maker. Yet, most if what it eats is normal tissue: miner. (And actually it isn’t a miner, because the larve lives on, not inside, the leaf).